Atari, my dude, please get it together. The classic console maker has slowly trickled-out details about its upcoming retro gaming machine over the last few months and each time it sounds more and more like this project is misguided. Today brought the biggest dump of news from Atari yet, and it’s too expensive, hasn’t been funded, and Atari doesn’t even seem to know who it’s for. From the beginning, the primary concern with the Ataribox has been the price. Would it fit into that $80 SNES Classic model, or would it be more like a high-end Steam Machine that does everything and only serves a small audience? Well today, Ataribox creator and general manager Feargal Mac answered that question in an interview with VentureBeat. It turns out the Ataribox falls somewhere in the middle of every console, new and retro, leaving it in a weird no man’s land. According to Mac, the Ataribox will cost somewhere between $250 and $300. It’ll run Linux and have an AMD processor with Radeon graphics, facilitating a more open, PC-like experience than standard set-top boxes. But if that sounds intriguing to you, you’ll have to wait a little while because Atari needs to crowdfund it through IndieGoGo first. Mac said that a campaign to raise cash will launch in the Fall and shipments are expected in Spring of 2018. Mac said that the machine will run PC games, but it will also be capable of doing streaming, running apps, browsing the web, and playing music. As far as games go, the machine will run the kind of games that a mid-range PC can do today, but it won’t run Triple-A games that require high-end PC performance. Hmmm. So, it will include “a large back catalog” of Atari games and then you can buy more games that aren’t very taxing on the hardware. It kind of sounds like an Nvidia Shield, honestly. But that thing has some pretty powerful hardware, can stream 4K with HDR10 support, comes with an Xbox-style controller, and costs $179. We don’t know what the specs are on the Ataribox, but if it tops out at $300, the ability to access Steam with some free Atari games thrown in really doesn’t seem like it can grab people’s attention. You know what you can get for $300? A PlayStation 4. Hell, for $180 you can get a refurbished Xbox One. In both cases, you’ll get access to those consoles’ exclusive libraries, as well as all the other apps that Atari is talking about. And while you won’t be able to use Steam, most of the big indie games are on these consoles. Minecraft? Check. Terraria? Check. Classic bundles with tons of Atari games for cheap? Check. But why make it look like all the other consoles—just go for the wood. We don’t know yet if the Ataribox will come with Atarti’s classic joysticks, but the company would be crazy not to include them. If Atari ends up selling the joysticks separately, that’ll be an even bigger head-scratcher. Basically, this all sounds like a streaming box that you’d choose if you like the style, want a modest gaming console, and don’t care about cost. Sure, that could work out. I certainly love the way it looks. 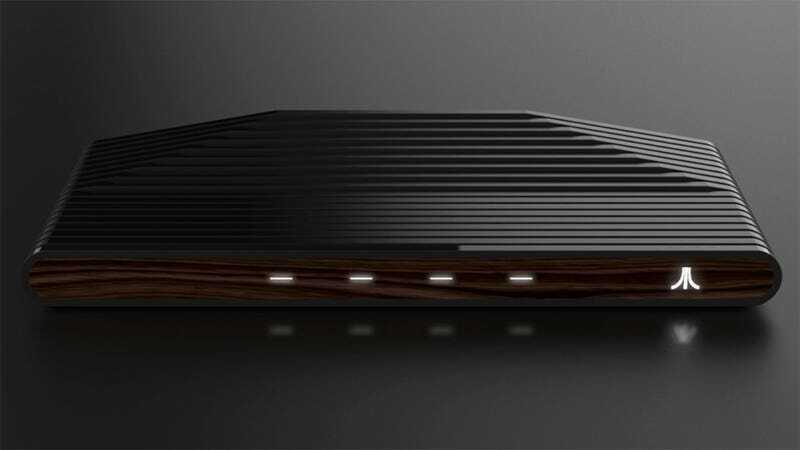 But Atari is trying to offer several things that others are already doing for cheaper, and no one is prepared to associate the company with top-notch hardware. If you’re just feeling the itch to play some Atari games with a joystick, the Atari Flashback 8 Gold has you covered for $60.